Three weeks ago, there was only one sensible answer to the question. Coming off the soggy Heinz Field sod, the Bengals had suffered their 10th straight loss. The Steelers got 14 points on two ugly interceptions thrown by Carson Palmer in a game he looked to have finally proven he had indeed lost his stuff. Terrell Owens was openly critical of the play-calling, Chad Ochocinco was ‘numb,’ and Marvin Lewis looked shell-shocked. In short, the wheels had completely come off, and it was clear that this 2010 squad had to be the worst, most underachieving group in team history—at that’s saying something. Fan attention began to turn towards draft slots, rookies coming out, and head coaching candidates. Andrew Luck and Cam Newton entered the conversation at QB, along with coaching candidates like John Gruden, Jim Harbaugh, Brian Billick, Mike Martz, and others. But a funny thing happened on the way to total implosion. The dead cat bounce. The Bengals gutted out a tough 19-17 win over a solid Browns club, and then hung their most points all year (34) versus San Diego on the number 1 defense in the league desperate to keep their playoff hopes alive. Both wins were impressive and respectable. As Bengal fans, we’re used to seeing this kind of thing. The long dead Bengals suddenly show some spark and enthusiasm and reel off a few wins to propel confidence into the offseason. Typically, the “bounce” causes owner Mike Brown to sense a need for calm and continuity that tends to save coaches and players who’d be long gone in other organizations. Sometimes it pays off, like in 1988 when Paul Brown chose to retain Sam Wyche, and the next year they went 12-4 and came 36 seconds away from winning Super Bowl XXIII; or in 2008, when Mike Brown chose to make no changes to a 4-11-1 team that would sweep the division and go 10-6 in 2009. So as we head towards the final game of 2010, Mike Brown has some decisions to make once again. Does he choose to let go of Marvin Lewis? Does he blow up the roster and start anew? Or does he go with his usual instinct, and keep things status quo, hoping that continuity is enough to turn things around. A week from today we’ll know. There are certainly arguments for both positions. There is absolutely no logical reason for the Bengals to be 4-11 at this point in the year. The roster that went 10-6 with a division title is virtually unchanged. If anything, it was better, with a very solid draft class, and Terrell Owens replacing Laveraenus Coles at WR. The team’s lackluster, half-hearted efforts early in the year were painful to watch, and inexcusable for a coach. The Bengals showed no mental toughness or aggressiveness in losses to Cleveland, Tampa Bay, Buffalo, and the Jets. Lewis has been given 8 years of patience to get this team to the promised land, and in those 8 years he’s managed just two playoff appearances—both first round losses at home. Coaches with more success are unemployed right now. Carson Palmer has not shown the type of field leadership seen from players like Dan Marino and Peyton Manning. He doesn’t display the excitability of a Brett Favre, Ben Roethlisberger, or Philip Rivers. He’s calm. He’s quiet. He’s confident. And while that demeanor may work well on a well-oiled machine like USC, or a stacked roster of professionals, it doesn’t work when in the midst of a team in turmoil peopled by divas and me-first personalities. But before Marvin Lewis, the Bengals suffered through years of poor scouting, poor drafting, poor management, antiquated organization, and as a result, terrible performances on the field. 2 playoff appearances in 6 years is unacceptable in places like Pittsburgh and New England, but its better than the entire decade of the 90’s here. Carson Palmer had a 157.2 rating yesterday, (a career best) and has now gone two games without a pick. Ironically, two games without Batman & Robin on the field. Looking at the roster, there’s no need to panic and do any wholesale changes. There is young talent all over the place. The defense has up-and-comers like Carlos Dunlap (8 sacks), Rey Maualuga, Geno Atkins, and Rodderick Muckelroy staking their claims to starting spots. On offense, youngsters like Jerome Simpson, Jermaine Gresham, Jordan Shipley, Andre Caldwell, and Bernard Scott are making the most of more opportunities. 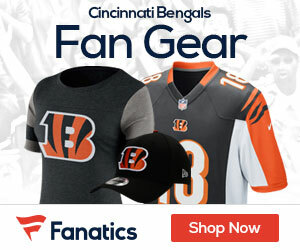 No matter who the coach of the Bengals will be in 2011, there’s no reason to hit the panic button. This team has talent. Perhaps the only purging that’s required is to cancel the T.Ocho show in the ‘Nati. Was the lack of focus on offense the result of the sideshow that T.O. and Chad provided? Was the offense’s poor performances, mistakes and miscommunications the result of an overly confident and undisciplined superstar receiver tandem, that forced an abandonment of the running game and what made the Bengals so good in 2009? Were their ego-driven personalities too much for Lewis and Palmer to control? The last two weeks seem to suggest so. For his part, Marvin Lewis is acting like he has no intentions of leaving, and Mike Brown may have no intentions of firing the coach. Looking at his body of work as a whole, Lewis has done more to help Cincinnati’s football team than anyone this side of Sam Wyche, but the team has yet to win a playoff game under his watch. So, Bengal Gab Nation, what is the right course of action? Quibble time. You can’t fire Lewis since his contract expires next week. If he was under contract you could fire him. I say once his contract expires, hire a new coach. Let the new team make personnel decisions on QB and everyone else, within reason. Don’t want a Josh McDaniels situation.